The Southwest of the USA, and especially California, holds a mystic of carefree living, fast cars, and Hollywood movie stars. The reality is that the Southwest has beautiful Pacific Ocean coastline, the scenery of some of the best National Parks in the US, and pristine sections of the famous USA Mother Road, Route 66. Since 2008, we have conducted an annual two-week motorcycle tour for MCi Tours that traveled through some of the most scenic sections of the American Southwest. Each tour started and ended in Los Angeles, California, which is where we met our guests from the United Kingdom to begin our adventure. Julie and I had our two BMW K1200/1300S’s that we rode down to LA from our home in Washington State, and the UK guests rented Harley Davidson, Honda and BMW motorcycles of assorted models. 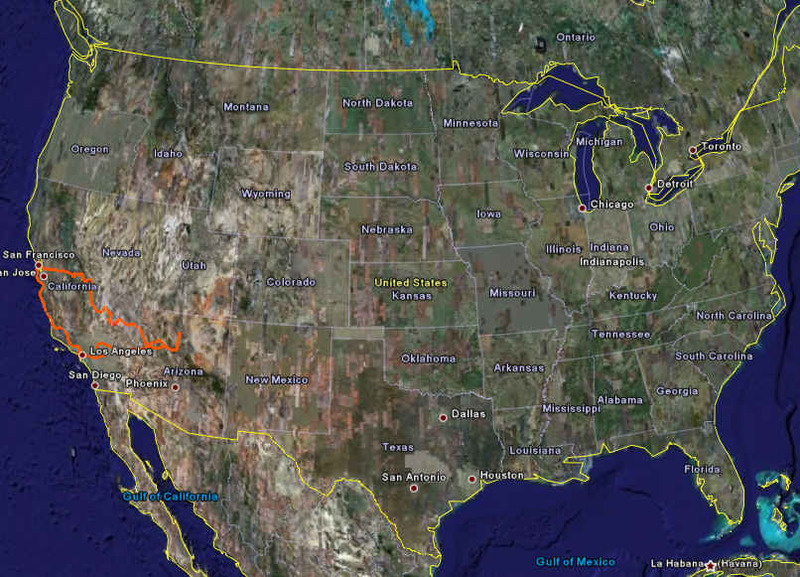 These Google Earth maps show our tour route relative to the entire continental US. The orange lines are the actual GPS-recorded tracks of our journey that covered 2348 miles in the States of California, Nevada and Arizona. After climbing through some great motorcycle roads in the coastal mountain range of Southern California, our route descended onto the Pacific Ocean coastline and one of the most famous motorcycle roads of the USA, the Pacific Coast Highway (PCH). Also known simply as Highway 1, the PCH offers great hairpin corners, sweepers, and fantastic rugged coastline scenery. Either enjoy the road, or enjoy the scenery, but not at the same time or you might get wetter than you planned. Some of the sights along the way included the beautiful and rugged coastline, abundant wildlife, and the Hearst Castle at San Simeon. The tour followed Highway 1 all the way to San Francisco and across the picturesque Golden Gate Bridge. Next up, one of the most picturesque and famous National Parks in the USA, Yosemite. Yosemite Valley is a relatively small part of this National Park but its signature landmarks of El Capitan, Half Dome, and Bridalveil Fall are familiar to nearly everyone. The high country of Yosemite is arguably just as beautiful and far less visited. The MCi Tour went through this part of Yosemite as well, as we crossed over Tioga Pass at 9,943 feet elevation. In contrast to the height of Tioga Pass, our tour also went to the lowest place in North America, Death Valley. Another US National Park, Death Valley is a land of vastness and variety. Although the mid-summer heat can really ruin your day if you are not prepared, we have been there in late September and it has always been delightfully over 110°F. Actually, that is unseasonably warm, well, bloody hot, but we were prepared by having good riding suits and had been drinking plenty of water. If you enjoy glitz and glamour, and action that never stops, Las Vegas is for you. The casinos are amazing works of architecture and creativity designed to attract gamblers for a chance to "hit it big." The spectacle of it all is nothing short of amazing and well worth seeing, even if only briefly. It is hard to imagine that many people actually "hit it big," after seeing all the money that the casinos have to be making to afford such lavish settings. No one can visit the Southwest and miss seeing the Grand Canyon. It is certainly one of nature's greatest sights, and one of the seven natural wonders of the world. We had two days at the Grand Canyon, giving us time to view the canyon at sunrise, sunset, and even from a helicopter, spectacular. The final treat of our California Dreaming Tour was to ride sections of the USA's Mother Road, Route 66. During the Great Depression and later, Route 66 was a lifeline through the heartland of America, taking travelers to the promised land of the West. Now, Route 66 has been replaced by modern freeways that bypass the small towns and businesses that were so much a part of this Main Street of America. Our tour took us on some of the best remaining sections of Route 66 to experience a bygone era of the USA from the slow lane. These California Dreaming Tours were full of experiences that will never be forgotten. The scenery was fantastic, but much more than that was getting to know these great groups of people. We would love for them to travel with us again anytime.